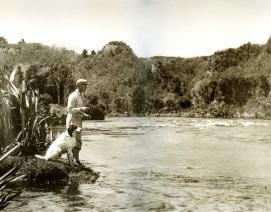 Back in the 1920s, a charming Irishman, by the name of Alan Pye, arrived in Taupo, New Zealand, having heard tales about the size and fighting spirit of the magnificent Rainbow and Brown trout being caught in the numerous streams, rivers and lakes. Finding all the rumours to be absolutely true Pye set about purchasing land in a prime position, on the banks of the Waikato River, upstream from the mighty Huka Falls. Here, he established a simple fishing camp, famed for its exceptional angling and generous hospitality. We are partnering with Chris Jolly Outdoors who will provide our Huka Lodge Fly Fishing Tournament anglers with a team of experienced and knowledgeable local guides to ensure you enjoy fantastic fishing.. Fly fishing will take place in over 25 of the best spots, in the amazing crystal-clear rivers and streams around Lake Taupo, throughout the tournament. Al just loves fishing and is the author of several very popular books, Go Fish: Recipes and Stories from the New Zealand Coast being one of them. He may be persuaded to share some of his chef’s secrets with Huka Lodge Executive Chef, Paul Froggatt, who intends to show you some wonderful ways to deal with your catch when it comes time to eat it! Returning to the Lodge after all the excitement of Taupo’s famous fly-fishing, more relaxing activities await. Complementing our stunning cuisine we have a Champagne station presented by Louis Roederer on the first night. We are also very lucky to have a tutored ‘Highland Tasting’ by Tom Fastier, Glenfiddich Brand Ambassador, featuring seven rare whisky releases. One evening will be dedicated to a ‘Tour de France of Wine’ dinner with Ben Longhurst, Wine Ambassador from Eurovintage, who will closely collaborate with Chef Paul, to create a stunning food and fine French wine journey. On the day of arrival, individual fly-casting tuition will be available at the Lodge, for those who would like to brush up on their technique. We have also joined forces with Kilwell Sports Ltd, another very successful local heritage brand, who have been chosen to represent the iconic Orvis sporting goods in New Zealand. Kilwell and Orvis are well represented in a fabulous tournament prize pool, which is worth over NZ$13,000.00. The prizes include bespoke items unique to the tournament, with Rodd & Gunn products to the value of over NZ$2,500, as well as a Helisika helicopter adventure. There will also be prizes awarded daily, as well as a great little goodie bag for you to take home when it’s time to leave.